The Char de bataille de 40 tonnes (40 tons battle tank), also known as the Lorraine 40t (Lorraine is both a region of France and the company that made this tank), is a Rank IV French medium tank with a battle rating of 7.0 (AB) and 7.3 (RB/SB). It was introduced in Update 1.75 "La Résistance". Introducing tremendous firepower at its BR with its 100 mm SA46 L/58 gun on a highly mobile chassis. Unfortunately, it is plagued with poor armour, which encourages a battle role more similar to that of a light tank. 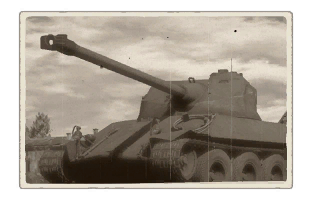 The Lorraine is one of the best representative of rank IV French medium tanks: it has good mobility, an oscillating turret (fitted with an autoloader), sloped armour in front and back, high hull, high gun placement, good gun depression, 4 crew member, a coaxial MAC 31 machinegun and large tracks. 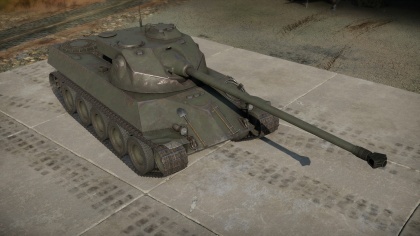 Specifically, the Lorraine distinguishes itself by having a pike nose, similar to that of an IS-3, road wheels instead of metal ones and it is the first French vehicle to be able to consistently pierce more than 200 mm of armour at standard combat ranges and it can do it seven times a minute. Even if its armour pattern is very efficient, with strong and well-designed angles, it is only at most 40 mm thick, meaning it will only bounce HMG fire. The best way to protect this tank is staying away from the action and taking down its foes as far as possible. This "medium" tank actually behaves as a light one: high top speed and acceleration, good turning rate (neutral steering) and awesome hill climbing capacity. Use its mobility to follow light tanks into large flanking manoeuvres, providing them an extra punch for scouted targets. In a more "static" usage (i.e. once in good position), its good reverse speed should get it fast enough into cover and out of bad situations if required. Suspension wheels are 20 mm thick while tracks are 30 mm thick. Use it as a sniper tank. Don't engage close quarters combat: it will only result in a ~8000 SL pile of scrap. Even if spalling damage is very good, one-shots are a bit rare: in order to destroy an enemy, immobilize it first, snipe the fire control group (gunner, gun breech, barrel,etc.) and then finish off the rest of the crew. In an average engagement you will need ~3-4 shots per enemy: the first shot misses, it is the ranging shot, the second hits (disables mobility) the third and fourth finish the job. If lucky, penetrating frontal shots can do enough spalling damage to incapacitate the entire crew. Great conical fragmentation from the gun. Frontal penetrations/center of mass shots are deadly. 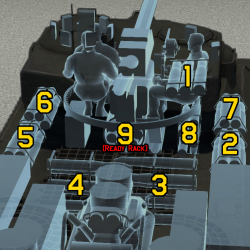 Very fast turret rotation speed, almost as fast as some SPAA. 7 rounds autoloader allows engaging multiple threats before having to "long reload"
At the end of the 1940s, during development of the AMX-50 heavy tank project, French engineers also decided to try creating a lighter tank that could serve the same role as the AMX-50. The project was initially designated “40 ton battle tank”. Later, the vehicle was called the Lorraine 40t, based upon the name of the region in which the experimental prototypes of it were built. The tank used many of the same technological developments of the experimental AMX prototypes, and was clearly influenced by the German Tiger II, Panther/E-50, and the Soviet IS tanks. With armor plating at a maximum thickness of 45mm, the Lorraine 40t isn’t as well armored as the AMX-50. The designers, however, set the armor plates on the Lorraine 40t at clever angles and implemented a chevron shape for the front of the hull (for which the tank is known). This effectively armored the most vulnerable parts of the front projection and effectively exceeded the equivalent of 90mm armor.. In addition, the Lorraine 40t’s lighter armor significantly reduced its weight, thereby increasing its speed and allowing the use of steel paired roller wheels with bulletproof tires. Combined with the 850 horsepower German Maybach engine, the Lorraine 40t could reach 60 km/h, move smoothly and fire effectively at low speeds. Two prototypes of the Lorraine 40t were completed in 1952. But the tank never reached production. This page was last edited on 29 March 2019, at 04:21.